Oh my gosh, we had snow here a few days ago. And to think, just a couple of weeks ago the weather was so nice that we didn't need sweaters, jackets, hats or mitts. 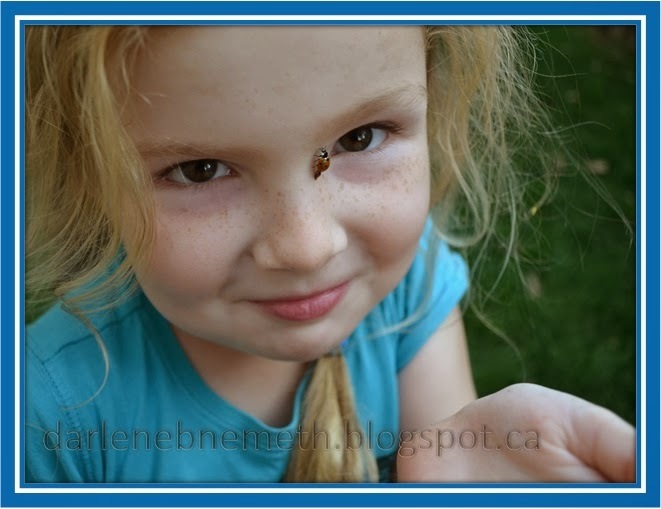 In fact not long ago my granddaughters were in the backyard wearing shorts and t-shirts while playing with bugs. 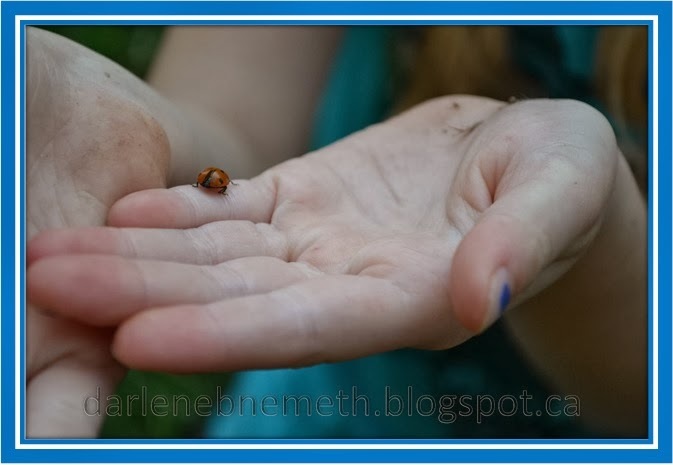 Happiness is playing with Lady Bugs. Hang on. Those aren't cute little Lady Bugs! Those are Mulit-Coloured Asian Lady Beetles! What am I talking about. Well, Lady Beetles look a lot like our Lady Bugs but there are a two main differences to help you distinguish the two apart. 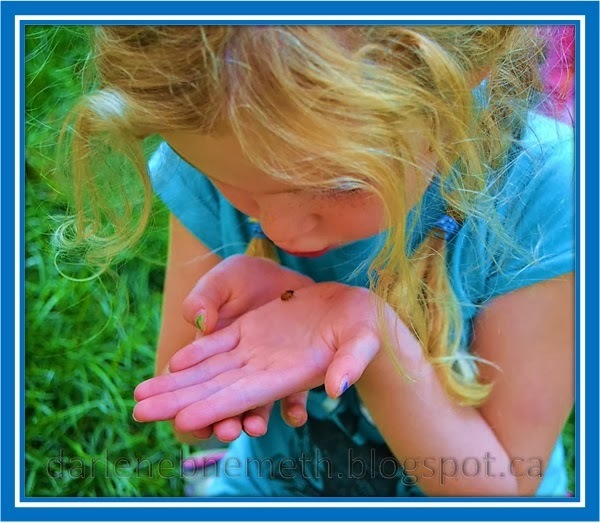 Lady Bugs are red with black spots but Lady Beetles are orange with or without brownish spots. Lady Beetles swarm in large numbers but Lady Bugs don't. The Asian Lady Beetle was introduced to the United States to control aphid numbers in orchards. They have now spread throughout North America. Asian Lady Beetles swarm in large groups during the spring and fall because they secrete a pheromone which summons other Lady Beetles. In the spring they will reproduce. Late in the fall, they will seek out warm places to hibernate for the winter. Your home just might be an attractive place for them to stay for the cold months. But don't worry - they don't cause property damage. However, Asian Lady Beetles are more aggressive than Lady Bugs. They will bite if aggravated. 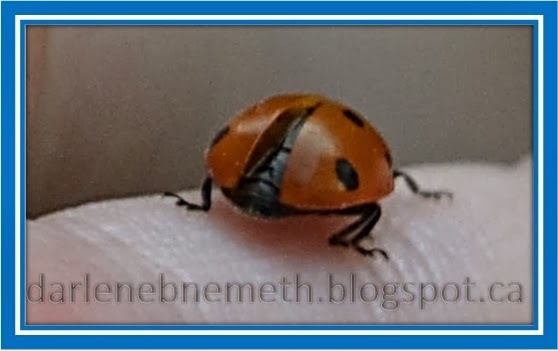 Lady Beetle bites are not poisonous but they may be painful. However, if you are allergic to their bites you may get rhinoconjunctivitis (pink-eye). As a matter of fact, Honey Bunny did get pink-eye the next day. Holy cow. I wish I knew that tidbit of information before letting the girls play with those bugs. Strange, none of the girls complained or commented on being bit. Oh ya, Lady Beetles will also secrete a yellowish fluid as a protective mechanism. My girls thought the bugs were peeing on them which made them a bit squeamish but not enough to stop them from picking up more bugs. Yes I made them wash their hands thoroughly after playing with the bugs. Now that I've read up on these "Lady Beetles" I'm wondering if I should have let my granddaughters play with them. Would you? Honey Bunny did get pink-eye but Baby Cakes and Sweetie Pie didn't. Oh, but they had so much fun. They would catch one beetle and it would fly away. Two seconds later they had their hands on another one. The three girls had such a great time hopping from one spot to another picking up bugs and watching them fly around. Happiness is living in the moment. Stopping to play with bugs and have fun. Happiness is appreciating and being grateful to the little things in life. 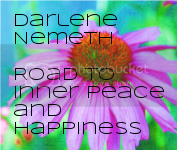 To receive my blog updates - please subscribe via email or follow through one of the other social medias.